“We are multi-dimensional beings connected in energy. The shamanic healer does not differentiate between physical, psychological, or emotional disease, but treats the being as an integrated soul. As part of All That Is, we seek the natural balance which is health. The shamanic healer works to extract that which is intrusive or disruptive and returns lost power and original essence. Shamanic Journeying and Empowerment: For thousands of years, shamanism has recognized the sacredness and connectedness of life, and has been a powerful tool of the heart to heal ourselves, our communities, and our planet. Shamanism is the oldest spiritual practice known to humanity and many of our modern day alternative healing practices, as well as western medicinal practices have derived from them. In this training, Suzanne will guide participants while drumming, through the shamanic journey process through the upper and lower worlds into our subconscious to find and retrieve tools of healing and empowerment for our lives and our world. Join us Friday evening on this journey into other realms of healing! During a session Suzanne will first meet with the Doctoring Spirits to get an analytic for the client’s spiritual health, happiness, and well–being. Any concerns or issues that the client brought up to focus on will also be addressed at this time. Suzanne will then work with the Doctoring Spirits to make any spiritual adjustments for one’s spiritual health and to restore balance and harmony to one’s being and life. These sessions are individually designed by the Doctoring Spirits to fit the needs of the client on a holistic level. As Suzanne works in partnership with Spirit to support the client’s spiritual healing and growth, doors are opened that may lead to the transformation of the body, mind, and spirit in miraculous ways. In this type of healing, Suzanne, in partnership with the Doctoring Spirits, journeys into the spiritual realms to locate and retrieve your vital life force. With the return of this essence, you may find yourself with more vitality, inspiration, joy, and passion for life. Sometimes as we travel on this journey of life we may lose some of our spiritual energy or power. This loss may show itself as apathy, feeling rundown, or just a lack of inspiration. Through the retrieval of our spiritual energy, we may again connect with our enthusiasm and joyfulness for life and in life. When we are empowered, the possibilities for what we can be, do, and have are endless. Suzanne will work in partnership with the Doctoring Spirits to locate and gently release any spiritual intrusions and to untangle any karmic incompletions from the past. When the body is energetically cleared of these intrusive and disharmonious vibrational frequencies, we invite back into ourselves more meaning and passion for life. In this healing, Suzanne will work with unraveling core belief systems that place limitations on your life. With these restrictions removed you may experience a blossoming of your pure potential. In this work, the shamanic healer travels back in time to make gentle completions, untangle any past life karma, and dissolve any energetic limitations carried over from the past. In this work Suzanne will also focus on bringing forward into the present any gifts, talents, strengths, or vital life force that may have been lost or forgotten. This may provide an overall feeling of well-being and harmony within oneself. This work involves the unraveling and release from any curses or spells that may have placed limitations upon us. The spiritual release from these curses may involve self-made curses such as personal oaths, promises, family and genetic curses or spells from outside sources. As we are freed from these limitations, we may find ourselves thriving in life with opportunities opening to us. 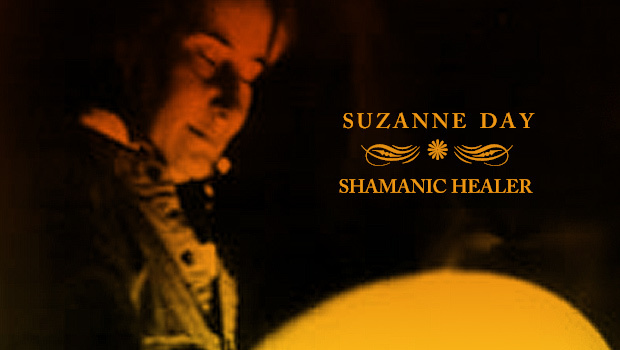 Suzanne Day has taught shamanism and has had a shamanic healing practice since 1989. She has lectured at two International Peace Conferences and helped facilitate numerous women’s ceremonies throughout the United States and Europe. Suzanne is a minister of the Blue Star Church and is also a sun dancer. Suzanne has studied with Michael Harner, PhD, founder of the Foundation for Shamanic Studies; she is a graduate of The Foundation’s 3-year program of Advanced Shamanism and Shamanic Healing. Suzanne has also trained with Sandra Ingerman, international teacher, healer and author. Suzanne is part of Sandra’s Shamanic Teacher’s Alliance as well as the Medicine for the Earth Teacher’s Group. She has studied Sami Shaman Ailo Gaup of Norway, and many other traditional peoples. Suzanne is a student of Native American Elder, Mary Thunder, who is a Peace Elder and International Ceremonial Leader. Suzanne’s education in the healing arts is extensive. She has been trained in the art of Qigong healing. She is a Reiki Master, Magnified Healer, and a channel for the healing power of the Holy Spirit. As a Master Herbalist, Suzanne offers education in herbal medicine and has created a line of vibrational medicines and flower essences. Suzanne’s profound connection to Spirit allows her to use her extensive training and experience to help individuals live a richer, healthier, and happier life. A private healing session with Suzanne provides an incredible opportunity to radically awaken, heal, and transform yourself and your life now. Suzanne will be available for individual healing sessions at Wind over Fire Healing Arts Center.